Arthritis can be a debilitating issue. With joint pain and stiffness throughout the body, fatigue, tenderness, swelling, and general weakness, it can be downright uncomfortable. Now you can get natural arthritis relief with this all natural Bath Salt Arthritis Soak designed to help reduce pain, inflammation, joint pain, and general discomfort caused by arthritis symptoms! We start with a Pure Epsom Salt Base of 100% pure Magnesium Sulfate, known to have detoxifying properties that help relieve muscle pain & joint pain naturally. 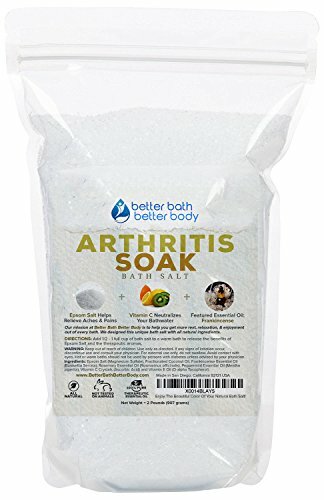 Epsom Salt is the primary ingredient in this "Arthritis Bath Salt" soak and makes the perfect addition to your Arthritis bath soak regimen. Next, we add Certified Pure Frankincense Essential Oil to create an aromatherapy and all natural healing blend perfect for helping relieve Arthritis symptoms. Frankincense has been shown to help reduce & prevent inflammation and joint pain, common arthritic symptoms. We also include Rosemary & Peppermint Essential Oils to balance the aroma and provide supporting benefits. Finally, we include Vitamin C (ascorbic acid) to help neutralize that nasty Chlorine & Ammonia lurking in your water. Vitamin C does this naturally & effectively, "grabbing" onto chloramine molecules and neutralizing them in a natural way. Unlike many other bath salts companies, we never include chemical additives like "Fragrance" that could prove harmful to your body and your mind. We take great pride in offering only all-natural bath salts to help you relax and solve common everyday problems like Arthritis. NOTE: Seek the advise of your doctor before starting bath regimen, especially if you're using medication or have diabetes. This product is not intended to cure, prevent, or treat disease. If you have any questions about this product by Better Bath Better Body, contact us by completing and submitting the form below. If you are looking for a specif part number, please include it with your message.